From the video. Yes, really. 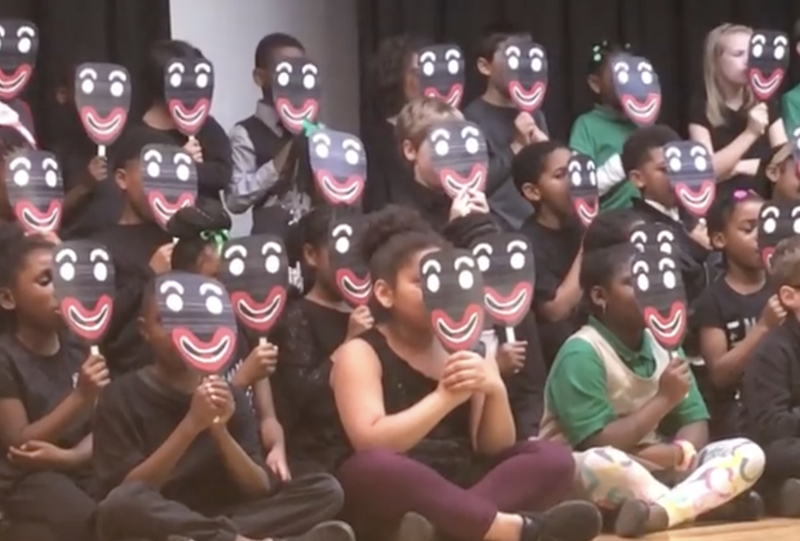 Latest case in point: On Friday, an Atlanta charter school had to issue an apology for a Black History Month program that had 6- and 7-year-olds holding blackface masks complete with bug eyes and red lips. And although the fact that the teacher was black was probably better than the teacher being white, using blackface to demonstrate “the mask” that black folks wear every day and having her white students wear it is the epitome of a good intention going straight to hell. It would be a stretch for a college theater class on the history of minstrelsy to get away with this, so why someone wouldn’t flag this at an elementary school is beyond me. The irony is that according to the school’s website, “Kindezi” is a Bantu word that describes the act by which a community educates, loves and values every child. In addition to an apology, Kindezi says it is planning to offer cultural-competency training for teachers—one of whom, despite her blackness, just made my week of racist pop-culture fatigue that much worse. Editor’s note: This post was updated with a Facebook response from the teacher who put on the show, explaining her actions. The text was modified accordingly.